Amplifier maker triples capacity with conveyors, carousels, RFID, and bar codes so the tempo of manufacturing keeps up with demand. Demand for QSC amps is so strong that the company tripled its production capacity recently. Helping to triple capacity are extensive materials handling and data capture systems. Included are roller and belt conveyors, horizontal carousels, radio frequency identification (RFID) tags, and bar codes. These systems are located in a 41,000 sq ft expansion to QSC's main plant. Open since July of last year, the new assembly line in the expansion is a build-to-order, demand pull operation, explains Bob Meigs, director of manufacturing. 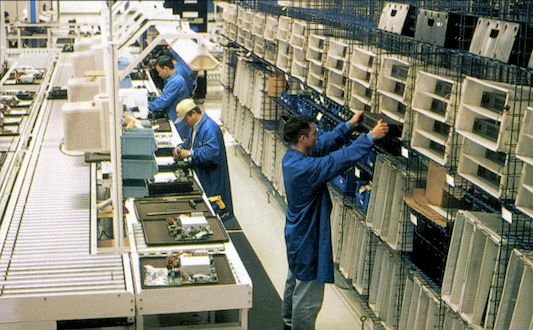 In contrast, the old assembly line remains a build-to-stock operation. "What we do here isn't rocket science," he modestly declares. "But our new assembly line is a very controlled, paperless manufacturing process. It's designed to enable QSC to meet its throughput requirements." Work-in-process (WIP) does rocket through the new facility in an enviable cycle time. Elapsed time spent from order placement to delivery of a finished amplifier to the plant's packout station is just 2 hours. On a two-shift-per-day production schedule, the new factory can turn out some 62 amplifiers an hour, or about 1,000 units each day. The old QSC plant with its build-to-stock assembly line nearby moves at only half that pace. Its capacity is some 500 amplifiers per day. From start to finish, a work order for an amplifier model can take 1 to 4 days to arrive at packout on the old line. Many of these orders had to be scheduled 3 months in advance of production. "More equipment, more space for assembly operations," says Meigs, help raise the new line's capacity, along with its highly automated equipment to build printed circuit boards. Making the new line's production rate and short cycle time of 2 hours all the more remarkable is the variety of amplifiers assembled. "They come in all sizes and shapes," says Meigs. 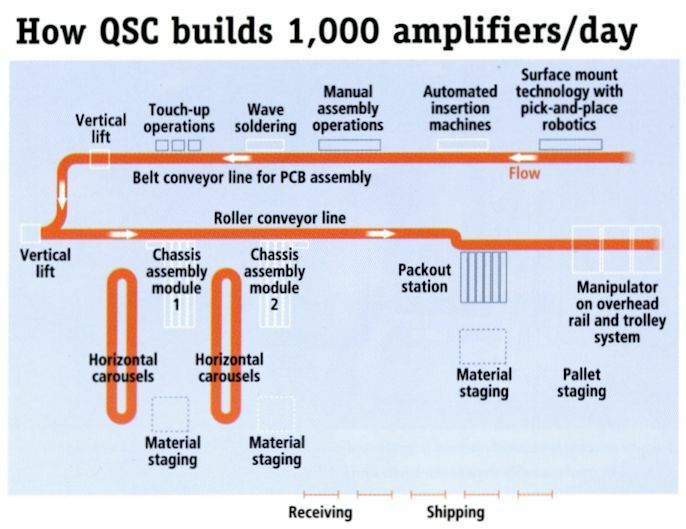 QSC builds a total of some 75 different models, plus it makes several advanced amplifier products. Yet the economic build quantity is just one amplifier in the new line in the expansion. "Our process is designed for manufacturability," Meigs explains, "so that the different amplifiers are easy to assemble and we can keep our quality high." QSC relies upon smart conveyorized assembly with horizontal carousels feeding parts to assembly technicians in their work cells. RFID tags placed on WIP pallets create the capability to track each amp through production. And bar codes with serial numbers for each amp model QSC assembles are the keys to releasing instructions from databases to automated manufacturing systems as well as to technicians in manual assembly cells on how to build any individual circuit board or amp product. At the start of production, says Meigs, a single bar code is placed on the printed circuit board for the specific amplifier model to be made. The bar code contains part, revision, and serial numbers. When the bar code is scanned during assembly steps, the numbers are relayed to one of several databases. A host computer then sends instructions back to the line with all the information needed to build the specific product at the particular point of assembly. This "recipe" procedure covers all the steps from PCB assembly through chassis assembly and testing and on to pack-out (see layout). At manual assembly workstations, technicians have computer monitors and use their intranet browsers to display what part of the recipe they need to follow. To achieve this degree of control requires that multiple databases be networked, Meigs explains. The databases contain such details as parts required, assembly instructions, and test procedures for each amplifier model. "All the data is readily accessible at various points on our assembly line Meigs says, aided by the intranet browsers and monitors. Assembly starts with building printed circuit boards on a highly automated line. Some manual assembly and hand "touchup" operations are necessary, however, particularly for larger parts put on the boards. A special belt conveyor designed to handle these circuit boards moves them through the various production steps. With the PCB built and ready to move on to chassis assembly and thermal testing, it is placed on a WIP pallet. Pallet and PCB are transferred from a belt conveyor to a roller conveyor in the final assembly area by two double-decker vertical lifts. Relying on data read from the RFID tag embedded in each WIP pallet, which in turn is linked to the bar code data on the PCB for a specific amp product, the host computer then balances work loads. It directs a specific pallet to the appropriate manufacturing cell for further assembly. It sends a particular pallet to a conveyor spur serving a work cell with an empty queue. Or it can direct the pallet to a spur with some queued WIP. Two horizontal carousels are located adjacent to the work cells. The carousels continuously rotate at about 30 ft/min. They provide a supply of empty amp chassis and other components to each cell. "The carousels are a slick way to have all the parts in stock we need," says Meigs. "A technician just waits a few seconds for the right parts to come by and then picks them." Replenishment is by warehouse employees. "We never run out," he says. It also eliminates kitting of parts. Few components are stocked by QSC. Instead, suppliers provide just-in-time service to the line. "On a Thursday night, for example, Meigs says, "we'll receive the parts we need to build amps on Friday. We're a demand pull factory." During assembly, each chassis undergoes as many as 350 functional tests for quality assurance. We get it right the first time. Repair orders for mistakes made on the line are nearly nil.